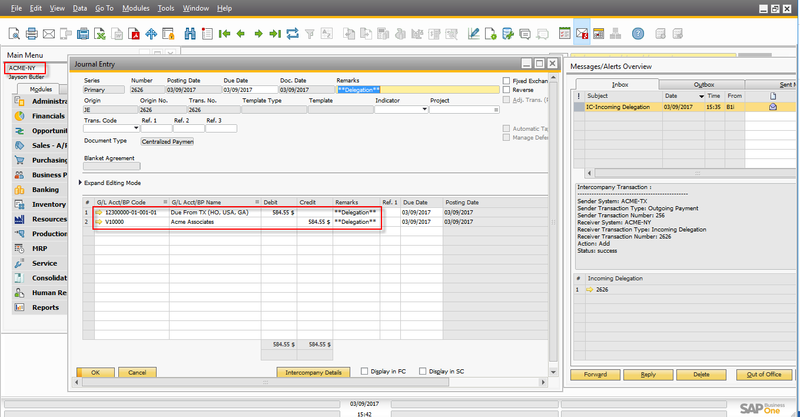 The Intercompany integration solution for SAP Business One automatically creates a reciprocal intercompany transaction in the SAP Business One instance of another business unit. The application does so in a standardized and transparent manner. The ability to automatically create a reciprocal transaction in the other application eliminates manual data entry, improves employee productivity, and reduces the potential for errors from re-entering data. 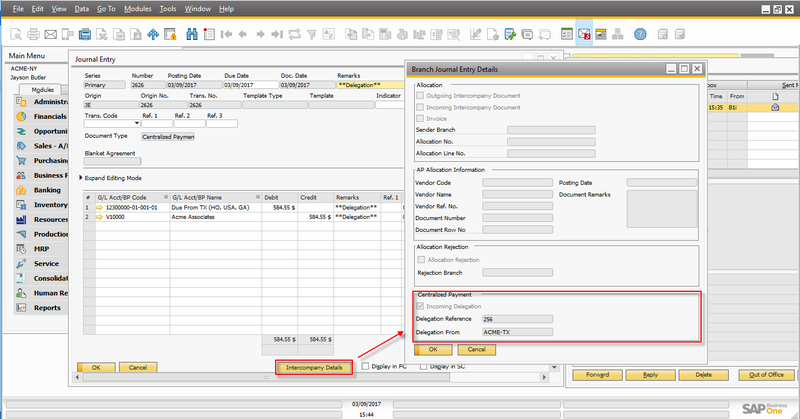 The centralized payment feature of intercompany solution allows delegation of vendor invoices for payment by another branch company. 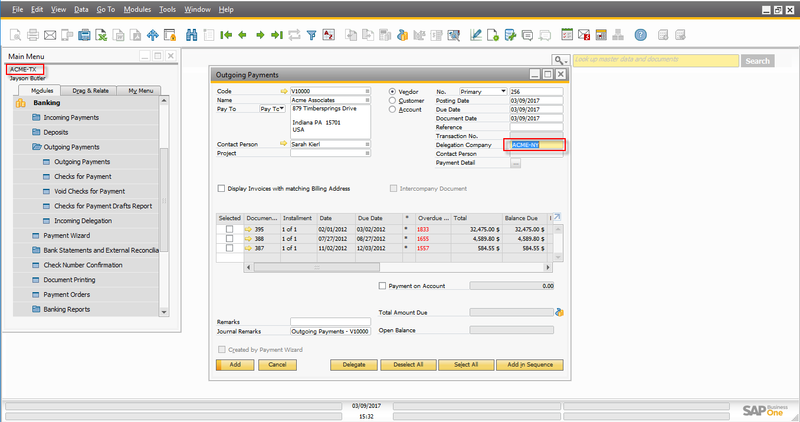 This means that payments to vendors can be executed centrally. The solution automatically creates appropriate postings to the intercompany accounts as defined in the branch account setup. 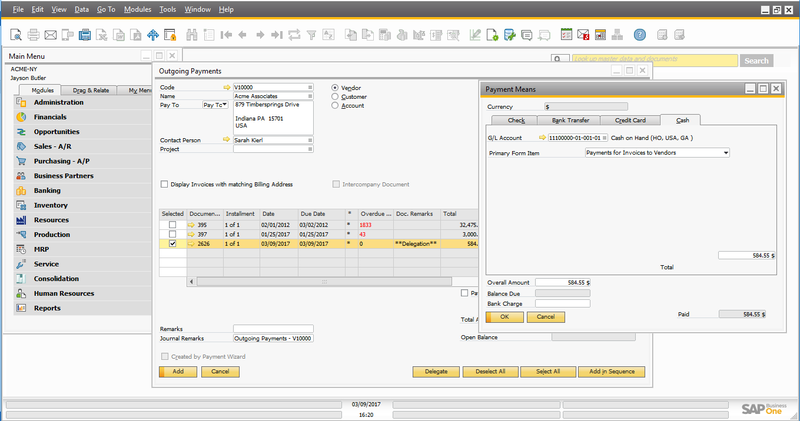 The Head office can process invoices from multiple subsidiaries and generates a consolidated payment to a given vendor. Since the payment processing is centralized, a better control can be exercised for payments thereby increasing cash-flow management. The head office can also delegate the vendor invoices to subsidiary to make payment on their behalf. Example: A subsidiary company (ACME-TX) delegates a vendor invoice to the head office company (ACME-NY) for payment to a vendor. 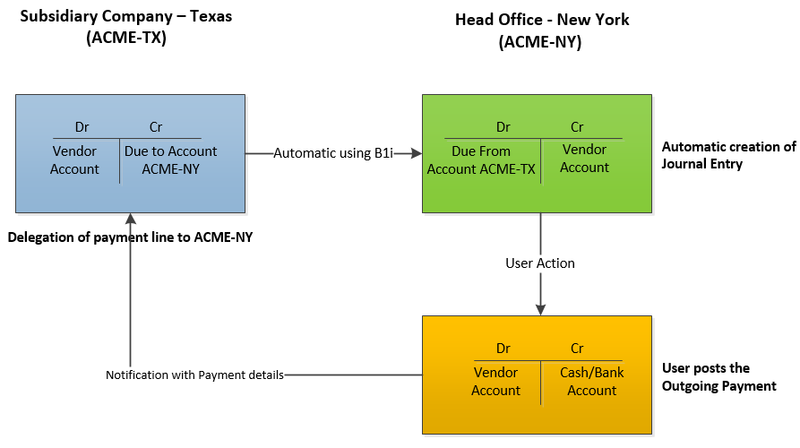 Let’s take the above example and perform the centralized payment transactions between ACME Texas branch and ACME New York head office Company. 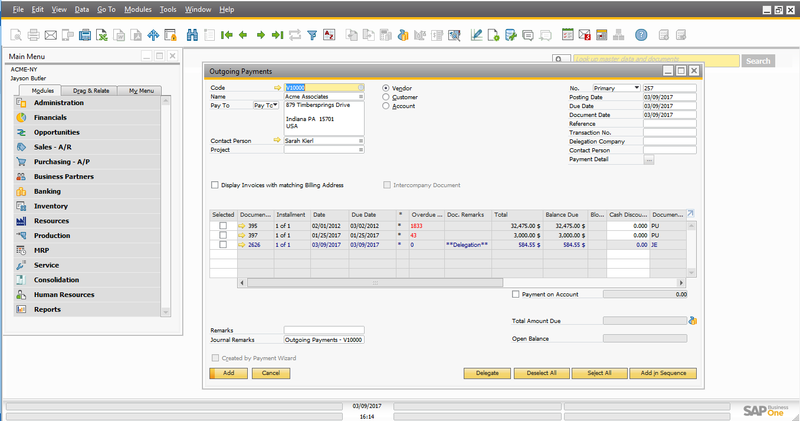 Login to ACME Texas SAP Business One branch company. 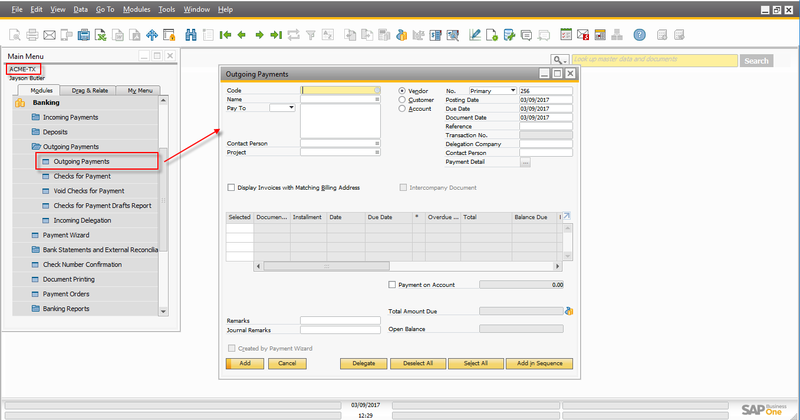 From the SAP Business One Main Menu, choose Banking -> Outgoing Payments -> Outgoing Payments. The Outgoing Payments window appears. 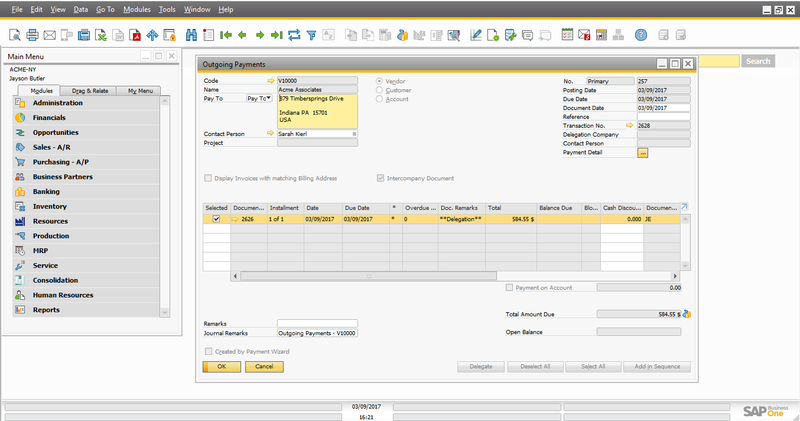 In the Code field, specify the vendor code “V10000“ to load all payment line items for this vendor. 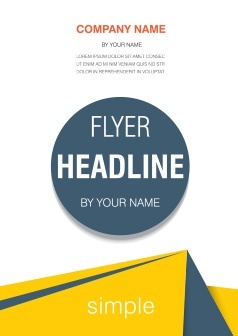 To delegate the payment line to ACME New York branch company, In the Delegation Companyfield, specify the branch code “ACME-NY“. From the Outgoing Payment window matrix, choose the payment lines that have to be delegated and choose the Delegate button as shown below. In the sender company “ACME Texas“, Intercompany Solution creates following journal entry as a result of delegation. 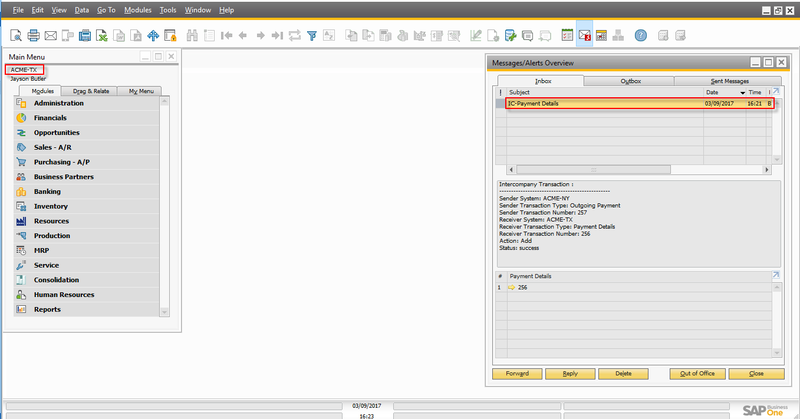 In the receiver company “ACME-NY“, the solution automatically create the journal entry for the incoming delegation. In the receiver company “ACME-NY“, User can check the incoming delegation journal entry detail by clicking the Intercompany Details button. 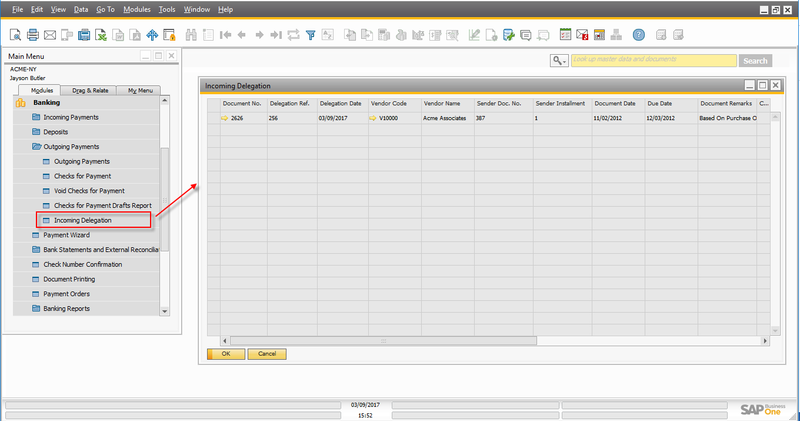 In the receiver company “ACME-NY“,User can view the list of all incoming delegation from incoming delegation window. To open the incoming delegation, go to Banking -> Outgoing Payments -> Incoming Delegation. The Incoming delegation selection criteria appears, specify the criteria and choose OK. The Incoming delegation window appears. In the receiver company “ACME-NY“,To pay the vendor against the incoming delegation, go to Banking -> Outgoing Payments -> Outgoing payments. The Outgoing Payment window appears. 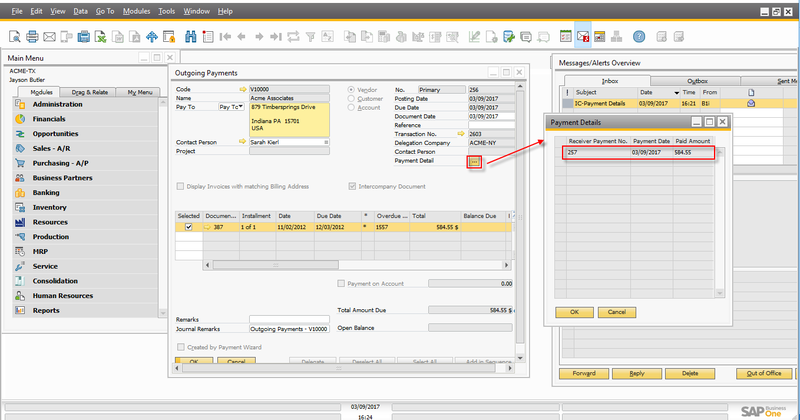 In the Code field, specify the vendor code “V10000“ to load all payment lines for the vendor. 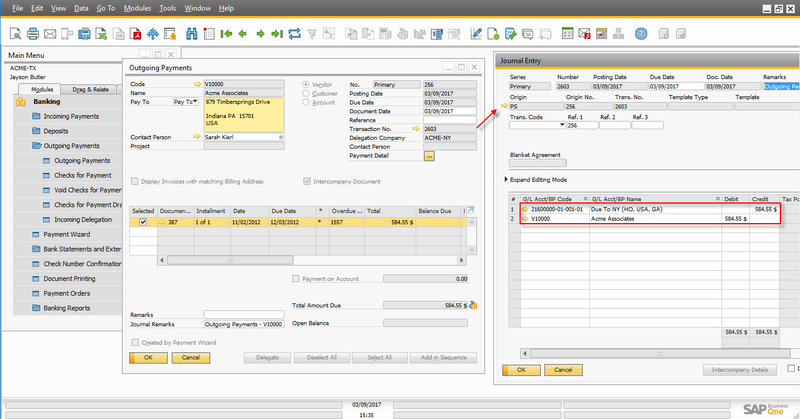 Select the delegation line journal entry and Post the outgoing payment against the delegation line as shown below. The “ACME Texas“ branch company receives the notification of payment Details. In “ACME Texas“ branch company, user can view the payment details by choosing the Payment Detail button on outgoing payment. 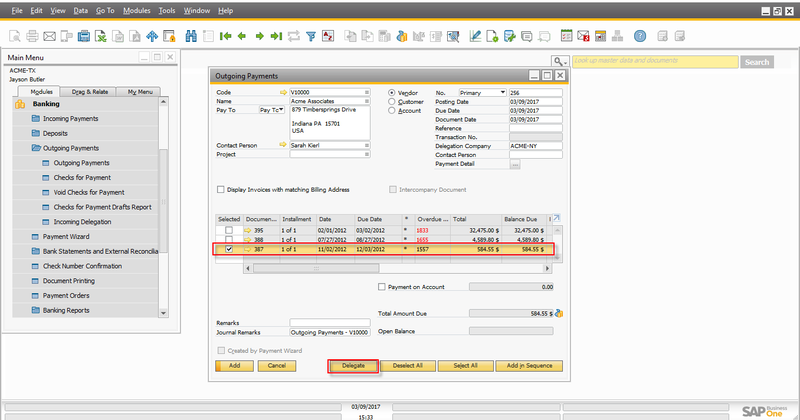 As you see in above example, the centralized payments feature of intercompany solution allows users to have a better control of vendor payments by minimizing errors in transaction entries across the organization.